Time to catch up on things a bit - awards, memes, upcoming events,etc. I think I am fully recovered from Simmering Soup Week now! Be sure to click here if you missed any of it - it has links back to all the days of soup recipes. Let's start with an award, shall we? I really do appreciate it when I'm given an award and very humbled by everybody's generosity. Kirstin from Loving Life gave me this adorable award! Thank you so much Kirstin! I'm going to bend the rules today and pass it along to you, my readers. 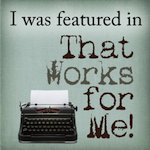 I know that if you're one of my readers, then you have a lovely personality and deserve this award! On to a meme - my fabulous friend Kim at Homesteaders Heart tagged me for this meme. 1. Go to your 4th folder on your computer where you store photos. 2. Select your 4th picture (no exceptions). 3. Post the picture with an explanation and a link back to your tagger. 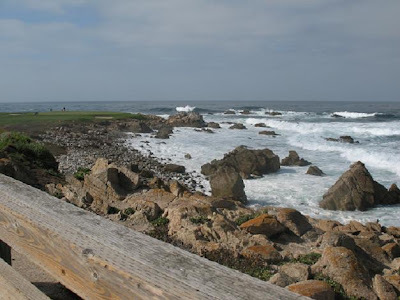 My 4th picture is from Seventeen Mile Drive near Monterey, CA. It's a shot of the ocean along the Pebble Beach golf course. We went there for our 15-year Wedding Anniversary. Gorgeous, isn't it? Bending rules again - if you haven't already done this meme and you feel like playing along, then consider yourself tagged and go for it! Let me know if you do, so I can see what picture you found! ~ Tomorrow (Friday) is Would You Like Chocolate With That? 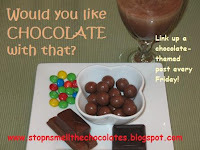 I will post something to do with chocolate and you can link up your chocolate post. Click here for more info and come back tomorrow with some chocolate! This Saturday's theme is antiques. 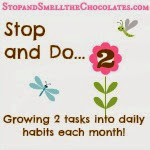 I plan on posting and linking up - how about you? Do you have something fun to share? 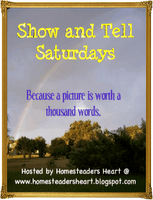 ~ Hard to believe, but it's time again for the Bloggy Giveaways Carnival. It starts on Monday! 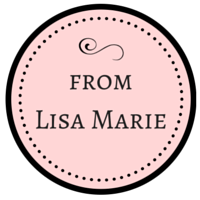 Be sure to check it out - there will about a thousand fabulous bloggy giveaways. I think I've covered everything...for now! Thanks for stopping by today and I'll see you soon! Phew! Sounds like a ton of fun coming up. I love the picture. Living in Florida it's always so neat to see other coast lines. When we went to Maine the coastline is so different and very rocky. I loved it. P.S. It's 29 degrees right now! LOL. What a perfect "tag" picture! I'm sure mine would a toe nail or something that my kids accidently took a picture of! Thank you for the award. It is nice to receive something even though I don't have a blog. You're a sweetie. I LOVE CHOCOLATE!